My man says nothing and gives me a look. (You can imagine what kind.) He thinks I’m nuts. I think I’m creative. Anyway, owning this acupuncture doll (at least that’s what I think it is) is a moot point as we have no entry way to display him in. We don’t own a house in France and live in a furnished rental place for now. And really, no, I wouldn’t want this perforated guy in my house, but I enjoy playing with ideas like this when I come across funky things. After all, one cannot live by IKEA alone. 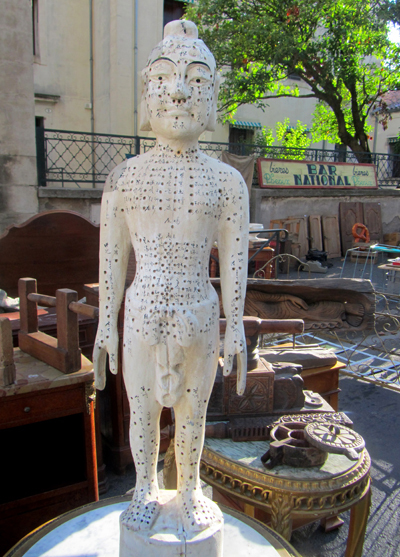 We’re scavenging around in a fabulous antique and curio market in the small town of Pezenas in the Languedoc region. It’s a twice-yearly event and the entire center is taken over by vendors displaying their wares on the sidewalks and in the streets. It’s not just any old flea market let me tell you. Just have a look at this sofa. How cool is that? Then again, would you want to sacrifice your spine to sit in it? Whoever did? Onward: A plethora of stalls are selling antique white linens – sheets and tablecloths and nightgowns, embroidered, be-laced and monogrammed. At one big stall I see complete sets of sheets, tidy piles of them held together with ribbons, looking fresh and white and never touched by sleeping bodies. Are they trousseaux never used? Do they whisper of heartbreak and sorrow? Of young, romantic girls spending years sewing and hemming and embroidering all for naught because their prince charming never showed up? Of grief-stricken girls growing into sad spinsters withering away their years in the house of a generous brother, never to use their precious sheets and table cloths? Or: These pristine, clean, white collections are fake, machine-embroidered by prison inmates in a distant eastern country. Could that be? How is one to know? Well, maybe French people do, and I don’t. I am somewhat of a philistine, as you may have noticed. Now, if you are in need of a touch of light, a touch of whimsy, how about these lamps? I’m thinking they might display nicely next to a modern IKEA bed, offer some contrast and harem-like charm. Or maybe not. The market is full of fun, funky and lovely things. Furniture and glassware and candlesticks and clocks and antique doors and farming implements of yore. Some things are more antique than others. This wanton mannequin is on the young side, I’d say, if not exactly virginal. (And no, my prince does not suggest we put her in our non-existing hall way.) You have a weakness for old dolls? You’ll find plenty here, all looking for a loving home. Do I actually buy something? Yes, I do! Three very old things. They fit in my handbag, weigh almost nothing and cost one euro for the three, less than a dollar. It’s a bargain! They’re vintage post cards and I cannot resist. I spent ten minutes sorting through several boxes full of them. I remember seeing them for sale in a street market in Paris a few years ago. Huge collections of ancient, old, funky post cards, neatly sorted. I have not seen them in the US or Holland. Is this a French thing? Here’s one of the three, dated May 11, 1924, almost 90 years old. A post card, 90 years old, how fascinating is that? The little poem reads: La parole s’anime et l’amour devient tendre: Tout est mysterieux pour se voir et s’entendre Which means something like: The word comes to life and love becomes tender: Everything is mysterious to see and hear The back is scribbled full in a tiny, cursive script of which I can read only bits and pieces. Something about the writer sitting in a train for four hours and taking advantage of the time to write the card. Oh, I can make up stories about this card – the sender, the receiver, both long gone from this earth, I expect. Such a strange thought I now hold a piece of their French lives in my Dutch hands. I’ll stop here before I start waxing romantic and sappy. Besides it’s time for us to meet friends for coffee. Sadly, we never write each other pretty cards. We text, phone, email . . .
Do tell me your flea market stories. What treasures did you find? Or do you detest these places with their old junk? Maybe you could stick flowers in acupuncture man? Oui? Non? I’d probably look for flowerpots at flea-markets, if we had them here. Guyana_gyal- Great idea about the flowers for acupuncture man.. He could be a full size “Chia Pet” or a vertical vegetable garden! Karen- I’m with you. I think acupuncture man is a hoot! I love going to markets anywhere but home. You’re right about the exotic holding more appeal than the familiar. My favorite treasure is a pair of linen table clothes I picked up in a Russian market for about $5 each. Every time I use them I think what a wonderful memory. You made the right choice! Love the postcards. I bought some beautiful antique Shanghainese postcards in China, but they didn’t survive the subsequent moves. Sad, they would’ve looked lovely framed. Antique markets! Oh, don’t get me started! I could get lost in them. Always coming away with something I don’t need, but really really want. I have not found one yet here in Norway. Which might be a good thing! I remember going to the “flea markets” when we lived in Germany and finding all sorts of treasures to furnish our humble apartment. I would love that bench in my entrance, not too comfortable but pretty nonetheless, good enough to drop the handbag on. I find it sad when people part with personal stuff like written postcards or old photo albums….they should always stay in the family! Love the market Love the sofa and the lamps. I would have the time of my life. We don’t have these markets in NZ. I know in Holland you have enormous ones, My brother goes regularly to an indoors one were you can buy stuff from all over the world.